The bamboo wood snack plates 'Little Chums Dog' with their silicone anti-slip suction cups are not only sustainable but also functional, durable and stylish. Ideal for dry snacks. Really enjoy snacking! 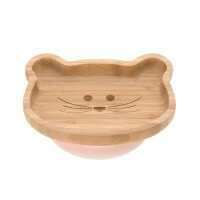 Product information "Bamboo-Wood Platter, Little Chums Dog"
Really enjoy snacking with a dog, cat or mouse from LÄSSIG’s Little Chums Collection. The bamboo wood snack plates with their silicone anti-slip suction cups are not only sustainable but also functional, durable and stylish. The plate is made from the fast-growing renewable material bamboo and is suitable for dry snacks. On smooth surfaces the suction cup keeps the plate fixed so nothing spills and the plate stays where you put it. 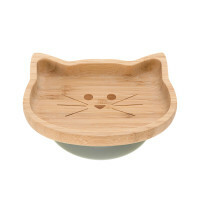 The snack plate is available in three animal designs – dog, cat or mouse.